The North round was delayed and the bus was twice turned around for bad weather at Leeds. big change for our team was the prospect of playing 11-a-side, which was very exciting, but also slightly scary playing on such a large pitch compared to previous years! However, with the help of our coaches, Mr Prescott and Mr Murray, we quickly adapted and began to focus on putting skills we had learned in practices into our play. is much more valuable, therefore you rely on every individual in the team playing their part to ensure we can all achieve our best. Lydia Newell was our captain this year and did an amazing job of making sure we were all in the right place at the right time. This resulted in an excellent turn-out for every fixture and practice and a lot of dedication from every player, which was great to see! It was a tough start to the season for the U12As, who took a little time to settle down into a pattern of play. However, they worked consistently hard and made rapid progress, with some great victories along the way. Throughout the term, the girls’ hockey really developed and they started to work effectively as a cohesive team; this, coupled with their improving ability to score goals, led to some good wins. These goals helped to improve their confidence and their self-belief, which were also driven by their fantastic attitude at all training sessions. well the girls had played and hard they were to break down. Stella King captained the girls admirably and Poppy Houghton played some of her best games as goalkeeper throughout the competition, stopping any heavy defeats. Despite the results, the girls and staff thoroughly enjoyed themselves. lost 3-0 to last year, and reaching the North East Finals. All of these results show how much we have grown as a team and it was great to see how close we all became and how much hockey brought us all together off the pitch, as well as on the pitch. We all had lots of fun throughout the entire season with the constant support of our coaches, the occasional McDonald’s trip on the way back from fixtures and Isabel Doyle’s non-stop singing, which proved to be a huge help! 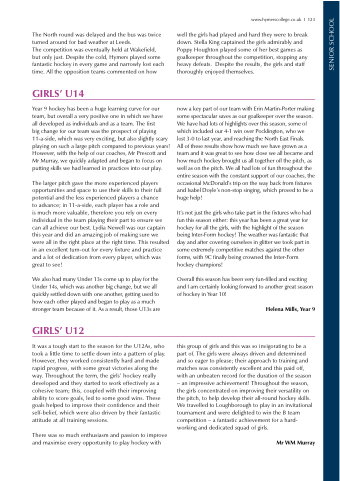 It’s not just the girls who take part in the fixtures who had fun this season either: this year has been a great year for hockey for all the girls, with the highlight of the season being Inter-Form hockey! The weather was fantastic that day and after covering ourselves in glitter we took part in some extremely competitive matches against the other forms, with 9C finally being crowned the Inter-Form hockey champions! Overall this season has been very fun-filled and exciting and I am certainly looking forward to another great season of hockey in Year 10! this group of girls and this was so invigorating to be a part of. The girls were always driven and determined and so eager to please; their approach to training and matches was consistently excellent and this paid off, with an unbeaten record for the duration of the season – an impressive achievement! Throughout the season, the girls concentrated on improving their versatility on the pitch, to help develop their all-round hockey skills. We travelled to Loughborough to play in an invitational tournament and were delighted to win the B team competition – a fantastic achievement for a hard- working and dedicated squad of girls.